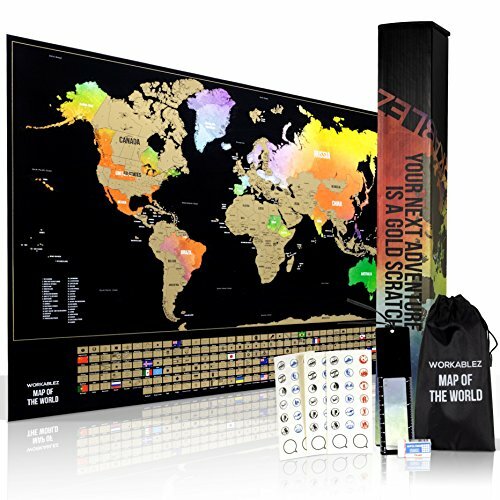 The Workablez scratch-off world poster is the perfect way to bring a piece of the world into your living room! Immerse yourself in dreaming of your travel adventures or future journeys - and develop your storyteller passion! Where has your travel bug taken you so far? Use the incl. scratch tool to embrace the beautiful watercolor, hidden behind the gold foil layer and reminisce about all your travel memories. The big world poster (17x24) also outlines all US states, as well as the country flags of every nation. Why don't you frame the sturdy scratch off the world poster to use it as an eye-catching wall decoration? The premium materials make sure that the world poster will accompany you for a long life of travels. The greatest pleasure lies in the anticipation:Share your travel stories with your friends & family and dream on about future destinations around the world. The scratch off world poster always gives you a fascinating overview of all the countries that still await to be explored! Get inspired and turn the golden poster step by step into a vibrant watercolor poster. Superior fun thanks to world poster accessories: The world poster comes in an amazing set. Use the colorful stickers, to customize your poster according to your travel style. The kit also includes an accessories bag, an eraser, a scratch tool and magnifying glass. Use the scratch off world travel poster as an unique gift! The scratch off world poster is a thoughtful gift, any travel enthusiast or daydreaming friend will get excited about. Explore the world together & scratch each country off one step at a time! The Workablez scratch off world poster is a must-have for any globetrotter - or for those who aspire to be one! Add it to your cart and bring on the travel bug! BEAUTIFUL SCRATCH OFF MAP OF THE WORLD - Bring memorable experiences right into your home! Reveal all countries you've already explored with the Workablez world Poster and reminisce; The world Poster also shows all US states - how many did you visit so far? If you have any questions about this product by Workablez, contact us by completing and submitting the form below. If you are looking for a specif part number, please include it with your message.